The kitchen can be one of the most intimidating rooms in your home to organize. 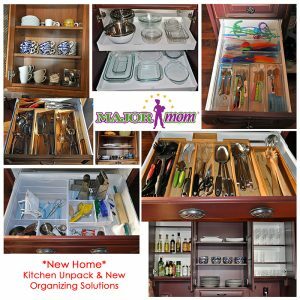 There are so many things unique to kitchen storage: utensils, dishes, bakeware, pots, pans, glassware, and food — the list is endless! 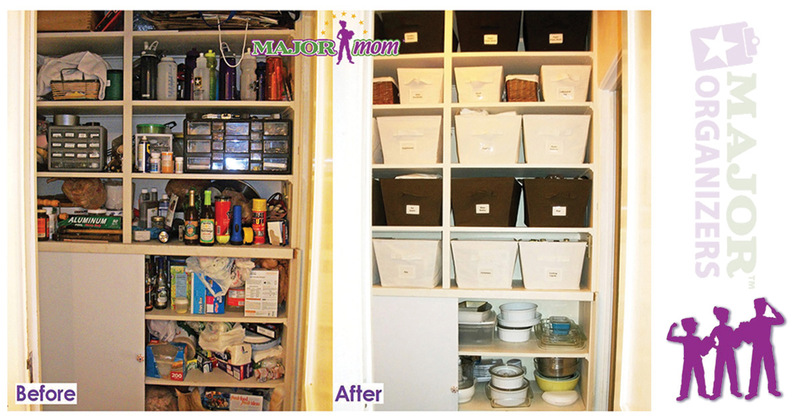 Major Organizers understands that it can be especially challenging to organize your pantry or dry food storage cupboard. No matter how difficult, this is really something that should be done at least once a year. Here are some tips to get you started! The trickiest part of organizing your dry food storage is knowing everything that you have to organize. This can be particularly difficult if you store food in multiple places throughout your kitchen. One method that may work well is to completely empty your food pantry and/or cupboards and place everything on the kitchen counter or table. Doing so will allow you to have a broad overview of all the food and give you a great jumping off point for the next suggestion. It doesn’t make sense to continue to store food that won’t be eaten because it is expired or unwanted. First, go through each item to determine its expiration date and have a trash bag ready for expired food. If there are items that are right on the cusp of expiration, consider whether or not you will actually consume them before they do expire. Pack items that are not yet expired or are unwanted in grocery bags or totes to take to your local food bank. If you’re not sure where the closest food bank is to you, click here to locate one. Remember: one man’s trash is another one’s treasure, especially when it comes to feeding the hungry! Keep similar items together. It might seem obvious, but keeping similar items together on the same shelf will keep you from having to search for something when you’re in a hurry. For example, keep the canned goods all together on the same shelf. If you want to get really crafty, keep all the green beans together separate from the Spaghetti-o’s. Alphabetize your spices: This might seem especially cumbersome or unnecessary, but think of how much easier it would make grabbing the right spice jar when you’re cooking. No one likes spinning around several spice jars to find the one you’re looking for. At a minimum, we recommend having a separate shelf or drawer for your spices. Consider who’s looking for what. If you have children that are old enough to help themselves to snacks, be sure to store these items at a lower level for easier reach. Likewise, if you’re health conscious, keeping all the healthy snacks together at eye level can help you stay on track when it’s snack time. Consider safety: It goes without saying that things such as alcohol should be stored out of reach of children. Likewise, if you have someone with special dietary needs, try to keep all of their food on the same shelf separate from other foods that could be unsafe for them to eat. Once you’ve devised a storage organization plan that works for your household, you may consider if labeling any items will help ensure your pantry or cupboard stays orderly. Labeling shelves or containers can make it much easier when you’re putting away food after grocery shopping or cooking — after all, no one wants to confuse the salt with the sugar! Smile and Take a Picture! After you’ve achieved an organized pantry or cupboard, consider taking a picture of it for future reference. 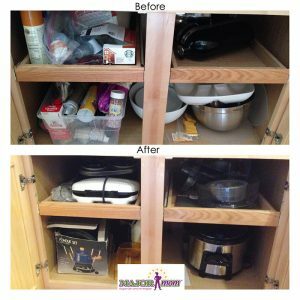 If you find that your pantry needs another overhaul at any point in the future, you can refer back to the picture you took to see what worked and what didn’t work the last time you organized. Something that seems like a monumental task can be made quite simple when you consider these tips and suggestions. If you find yourself wanting help with this project, Major Organizers is here for you! Consider contacting us to discuss our virtual organizing services or request a free estimate today. We look forward to helping you!